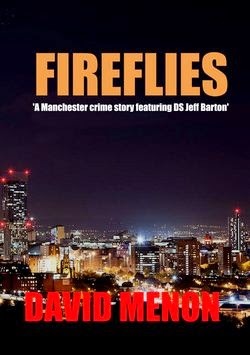 'Fireflies is the second in the detective superintendent Jeff Barton series of crime stories set in Manchester, England. Beginning with the discovery of the mutilated body of a naked man behind one of Manchester's hotels, Jeff and his team unravel a complicated case involving men who are seemingly being targeted whilst out partying to celebrate a friend's upcoming wedding. Someone is luring them away and murdering them. So is this the work of a psychopath? Or are the answers much deeper than that? Jeff is unconvinced about the guilt of a suspect early on in the investigations even though all the evidence points to them and slowly it becomes obvious to him that a much more cunning and therefore more dangerous force is at work here. This story goes to the heart of the long-term effects of bullying and how the scars not only run deep but inspire the victim to carry out their own style of revenge years later. It also brings him into confrontation with one of Manchester's most notorious gangsters with whom Jeff has 'history'. But is this crime boss really behind the killings or is Jeff only seeing what he wants to see? Why would someone target men in these situations? Why would they kill them in such a brutal way?